Candidates who have passed Class XII in 2014 from CBSE are eligible to apply. Just follow the below steps to apply for the CSSS 4th Renewal 2014. 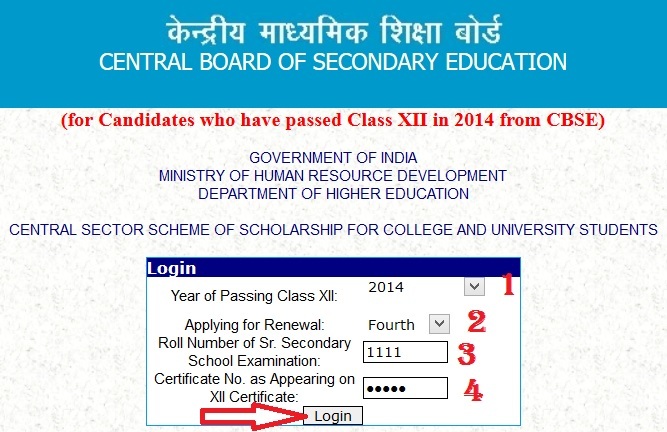 Step 1 : Go to the official website of CBSE provided above. Step 3 : Enter the following details to apply for the renewal. 1. How I can apply for scholarship? CBSE awards scholarship under various schemes. Details of these along with eligibility are available in Guidelines and Application form page. Applicant should ensure that he/she submits the application duly completed in all respect before the last date. 2. What are the reasons of rejection of application? The rejection may be due to Application not in proper format and non enclosure of relevant documents. 3. What is the definition of SGC (Single Girl Child) applicant? Single Girl child means a girl who is the only child of their parents and there is no brother or sisters. 4. I am single Girl in the family. I have one brother. Can I apply for scholarship under Single Girl Child Scheme? No, As per definition of Single Girl Children you will not be considered for scholarship under the scheme as single Girl child are those girl children whose parents have only one girl child and there is no other siblings. 5. I have received a cheque which has date expiring today only. How can I get a valid cheque? Normally CBSE sends cheque through partner banks by post and chances of delay are not there. However in such a case you may send the cheque to CBSE scholarship branch for getting a valid cheque. 6. Whether i will require to apply for renewal of scholarship again? Yes, you have to apply for renewal separately.